When owning small animals, one of the top priorities is protecting them from predators. Powerfields has a wide range of products that will suit your needs. 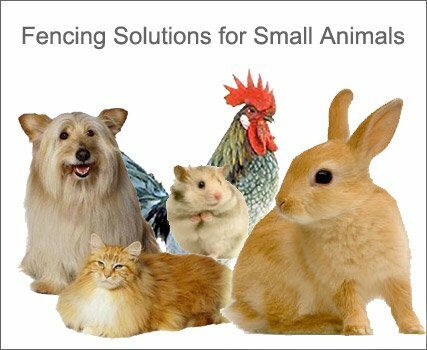 The Poultry Pen is a portable Posi/Neg Netting, allowing you to move without the need of a ground rod, perfect for backyard chickens, gardens, or any range of smaller animal. To accommodate larger or custom shaped areas, Powerfields' Polywire fencing can be used with our Portable Fence Posts. Powerfield's Solar Energizers are powered by an internal 12 volt batter, trickle charged by the built in solar panel. Install this on a T-post or a South/southwest facing wall for non-stop energizing. The 0.04 Joule Trail is powered by 2 D-Cell batteries and has a unique wind and rain-resistant case with a built-in fence hook. This energizer works perfect for camping trips, or building a small corral at a weekend horse show!